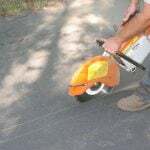 Need A Parking Lot Line Painter Before Winter? Most paving companies are beginning to close up shop for the winter by the end of November or early December. The good news is that there is still time to have your parking lot projects done; especially repairs and maintenances like line striping. So, if you are still in need of a parking lot line painter, it’s not too late. In fact, it’s highly recommended that you get your lot restriped before winter. Contacting your professional parking lot line painter before winter is important for several reasons. Clear Traffic Indicators & Space Markings – It’s already hard enough to operate a vehicle in inclement weather, so navigating a parking lot with no visible traffic markings or well-defined parking spaces is extra challenging. When snow piles up on a parking lot, even well-defined lines get a little hazy, so if your parking lot paint is nonexistent or extremely warn out, visibility in winter will be nearly impossible. Avoid Accidents – Traffic and other pavement markings are there for a reason. Without them, you may be increasing the chances of accidents on your property. With this, you’re also increasing your liability, since it is your responsibility as the property manager/owner to maintain the common areas; which includes the parking lot. ADA Requirements – ADA regulations require up-to-date parking lot markings. This is especially important when restriping a lot, as your parking lot line painter should be well-versed in current ADA regulations. Did you know that CT passed a law that requires an updated International Symbol Of Accessibility? Effective Parking Lot Design – You already know that in winter you are going to be losing some parking lot space (space taken by pile of plowed snow). If your parking lot spaces and markings were not designed correctly to maximize space, this means you’re getting even less space in winter. 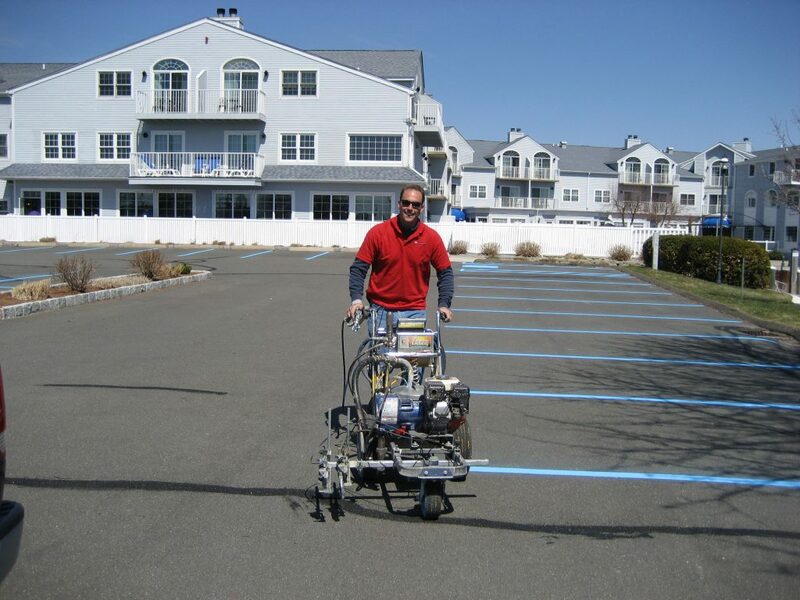 Not only can a professional parking lot line painter structure the most effective parking lot layout for your specific property and its needs, but it also ensures that you are controlling where vehicles go. If your parking lot spaces are not clearly marked, and the snow blurs these lines even more, vehicles will likely park haphazardly using their best guess, decreasing space. 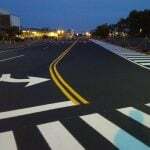 Bright and well-defined lines allow for the maximum number of vehicles, and ensures that traffic is being directed where it should to create efficiency and safety. Line striping is not an easy job, and it is not one we recommend you DIY. In addition to the actual paint job itself being very complex, ADA regulations, proper layout, safety traffic markings, etc. need to be done properly to be up to code and safe. 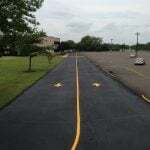 Since there is so much to consider, and a proper parking lot paint job requires extensive knowledge and intricate attention to detail, it is always best to contact your professional parking lot line painter for your restripe or new layout job. Wondering how much it’ll cost to hire a parking lot line painter? Well, to get an exact price, you’ll need to call for an in-person estimate (many factors can affect final price like; minimums, restripe vs. new layout, number of markings, time to complete, etc.). But, as a baseline, the national average parking lot painting job is around $1100. 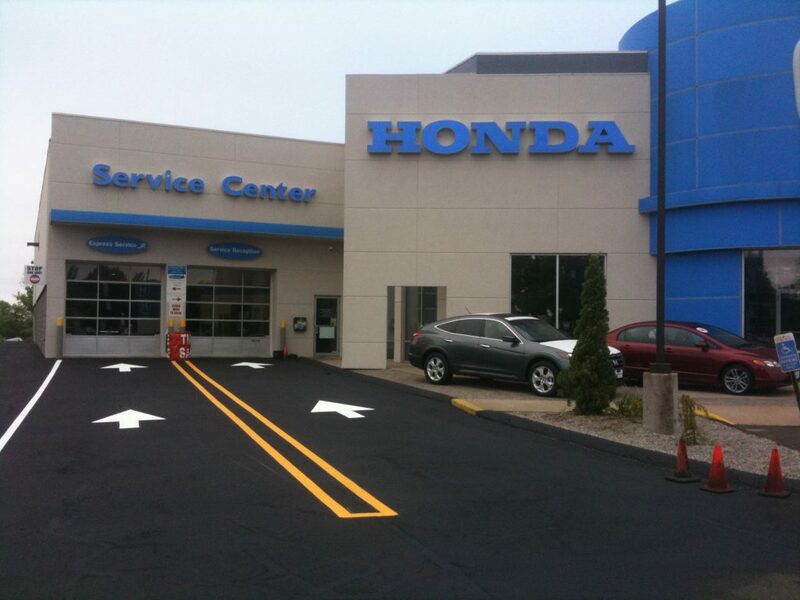 Visit our blog Parking Lot Line Painting: How Much Does It Cost? for extensive detail on this. To prepare your lot for parking lot paint, you’ll want to first inspect your lot and ensure repairs are complete. Then you’ll want to setup a plan for alternate parking arrangements for the day (or more) of work completion. You will also want to make sure that your lot is cleaned prior to your scheduled date of parking lot paint. Line striping needs to be completed on dry pavement. Make sure that your sprinklers are turned off at least 24 hours before your parking lot line painter is scheduled to come! 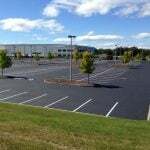 It is important to have your parking lot restriped before winter, and it’s not too late! Contact EastCoat Pavement Services today for your free parking lot striping consultation and make sure your lot is properly marked before our first snowstorm!